These brownies are the ultimate holiday treat. With less than 4 grams of net carbs and 170 calories per serving, they are the perfect after dinner dessert. One of the ingredients I used to make these rich and fudgy low-carb brownies is avocado. It may sound like an unusual ingredient to some of you but it&apos;s definitely worth trying. It adds richness and heart-healthy monounsaturated fats. Don&apos;t worry, you won&apos;t be able to even tell it&apos;s there! 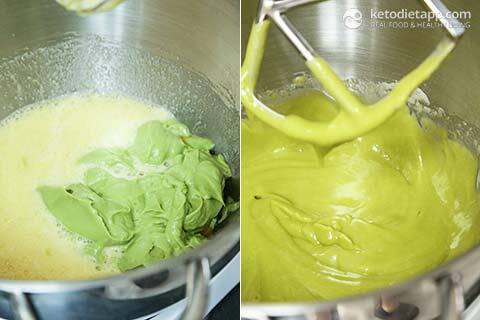 Apart from brownies, avocado works in other ketogenic treats like ice-cream. I used it in my Mint Chocolate Chip Ice-Cream, Key Lime Popsicles and Chocolate Popsicles. 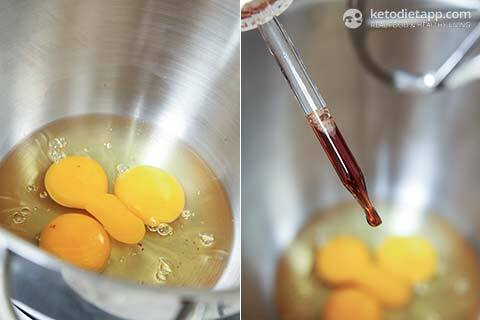 1/4 - 1/2 tsp sea salt - key ingredient! Preheat the oven to 175 °C/ 350 °F. Break the chocolate in pieces. Place a bowl over a pot of water and bring to boil. Keep on low heat and make sure the water doesn&apos;t touch the bowl (or use a double boiler). Add the butter and let it melt, stirring occasionally. ... and Erythritol and process until well combined. Halve the avocado and remove the seed. 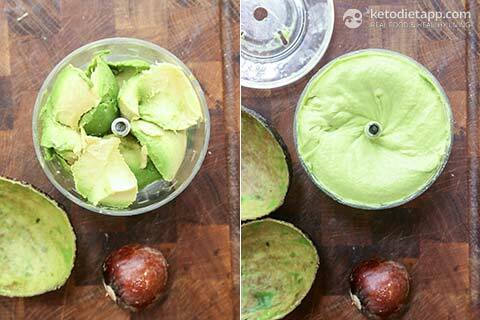 Use a spoon and scoop the avocado flesh into a blender. Add coconut milk and pulse until smooth and creamy. 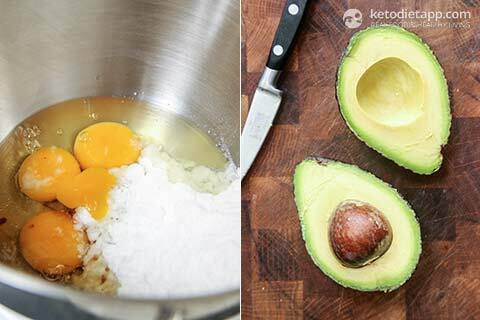 Add the blended avocado into the egg mixture and process until well combined. 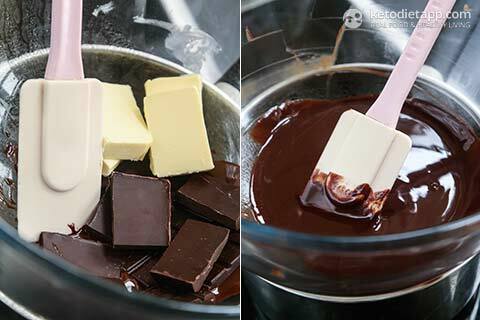 Pour in the melted chocolate & butter and mix until creamy. Mix all the remaining dry ingredients: almond flour, coconut flour, cacao powder, baking powder and salt. 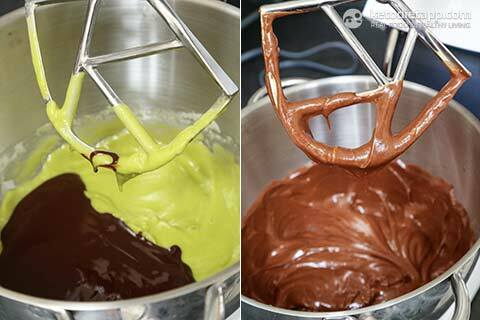 Add the dry mixture into the mixer and process until well combined. Place the dough in a baking dish (I used a silicone square baking dish like this one). Flatten with a spatula and transfer into the oven. Bake for 20-25 minutes or until set. Keep an eye on the brownie to prevent the top from burning. When done, remove from the oven and let it cool down on a cooling rack. When the brownie is hot, it will be crumbly. It will be easy to cut after it cools down. Enjoy with whipped cream or creamed coconut milk and cacao powder or cinnamon on top! Being new to Keto, I was a bit scare to try "diet" brownies, doubted they will hit the spot. How wrong was I! They are better than any mix or even made-from-scratch. So fluffy, light and with a bit of a mousse texture in the middle that got me totally sold! I did use 85% chocolate and maybe I did overdo a tiny bit on the Erythrol as replacement for the Stevia but I was scare they will be on the bitter side (I was wrong again). Pair amazingly with my bulletproof coffee in the morning. Who said eating Keto would be hard? It sure isn't when you indulge in healthy and amazing brownies as those! Thank you so much for your work on that recipe! A+ for sure! LOVE this brownie!! Definitely something I've missed and most other keto brownie recipes just haven't been quite as satisfying!! I forgot to pay attention to the grams for the avocado and just added one but will definitely be making these again. I also used bakers unsweetened chocolate, added additional Swerve and used sunflower flour because I can't have almonds. Mine were probably a little dry from not adding enough avocado but have a wonderful dense texture and rich taste. I can't believe this recipe is 2 years old and I've just found it! Thank you for your amazing recipes and for the diet challenges that keep me on track!! I made a batch of these brownies this afternoon. I didn't even wait until it had fully cooled to take a bite. Oh my goodness! 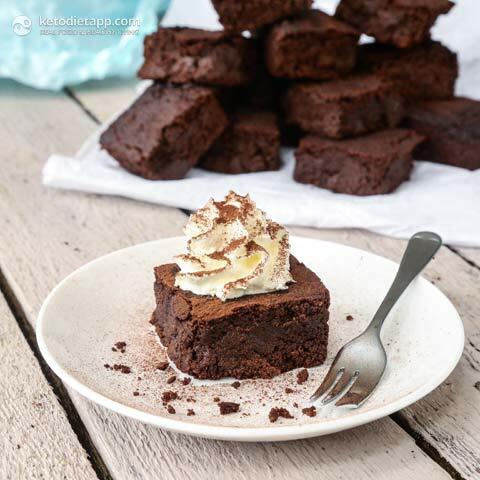 The only way to describe these brownies...fluffy and light like a whipped truffle cake brownie! Absolutely the most scrumptious dessert I've enjoyed in a long, long time and I haven't even added whipped cream yet! Oh the anticipation! The only thing I did differently was use powdered Xylitol instead of Swerve. I've been using Xylitol for years now and in moderation so haven't experienced any of the typical side effects you hear about. Thank you for creating such a delicious recipe! Thank you so much for this and all your recipes! Made this today for the first time. The brownies are so tasty, better than the "real" ones I used to bake long long ago... I made a substitution, instead of cacao powder I used organic cacao fiber powder, which is available here in Germany in low-carb shops. You can substitute 1:1 and get the same results but lower net carbs as with regular cacao pwd  Btw today I forgot the salt... you say it's a key ingredient, why? Only for taste oder is there another reason? Next time I won't forget  the recipe is amazing and for sure I will make it again and again and again... thank you! I tried using Erythritol but it has an after taste. Some people don't like the "cooling" effect of pure erythritol - you might want to try Swerve which is a blend of erythritol and FOS. I hope this helps! Wondering what amounts I need to just use cocoa instead of chocolate squares. Thanks. I'd guess you can add 1/2 cup cocoa powder, plus add 1/2 cup butter or coconut oil or cacao butter. I hope this helps! Ummm... I used your recipe to fool my 40 year old son into eating something healthy with avocado. But I'm not sorry! If I had mentioned to him that it had avocado, he would have insisted that he tasted it. But I kept quiet. He LOVED the brownies. Even the very very picky grandkids loved the brownies. I topped them with an icing that I whipped up with butter, cream cheese, vanilla and powdered Swerve. Good stuff. I'll be making this again! These are really really good. My family and I were super impressed! Thanks so much for this recipe. 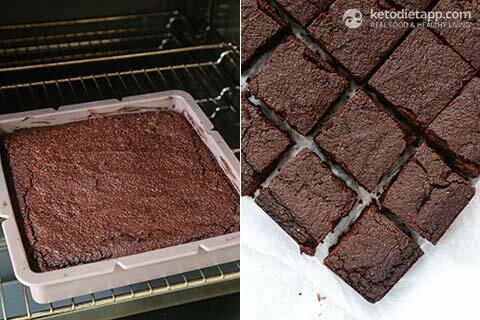 The first keto brownie that I tried was just awful, I took one bite spat it out and put the whole batch in the garbge. The texture of these is great and they don't taste low carb. This will be my go to recipe. Thank you Donna, I'm glad you enjoyed! Made them twice, delicious. These are a favorite in my house even for the non keto eaters. Second time made in a bigger pan, they baked better for me. Very grateful for the ingredients being in grams, I had to use 3 small avocados to equate 200 g. I used Nativa sweetener. Thanks for the recipe, these are a great treat. Thanks so much Kristi, I'm glad you liked them! I can't use Almond flour as I'm allergic to Almond. I use pecans that I grind down myself. The texture is crumbly but with a small dollop of thick double cream, it is a better alternative for me. I've lost almost 13kg in 10 weeks...and boy do I feel so much more alert and happy! Thanks for the amazing recipe! Hi, this recipe looks amazing, I'm going to try it tonight for dessert. I don't have any dark chocolate though, do you think it would work with cacao nibs? I also only have stevia powder/granules, would I only use about a tablespoon of this as I have heard that it can be quite bitter, or could I possibly use some vanilla bean paste? Hi Clare, if you don't have dark chocolate, try more cacao powder + butter instead. Cacao nibs won't work. Stevia can be used as an alternative. It depends on the product but if it's pure stevia powder, it will be 200-300 times sweeter than sugar. If it's granulated stevia mixed with erythritol, then it should be as sweet as sugar. I think the best approach is to add sweetener at the end, taste and add more if needed. Vanilla bean paste contains sugar - I'd personally avoid it and use either vanilla bean powder or unsweetened vanilla extract. I hope this helps! Is there any flourless version of this recipe? 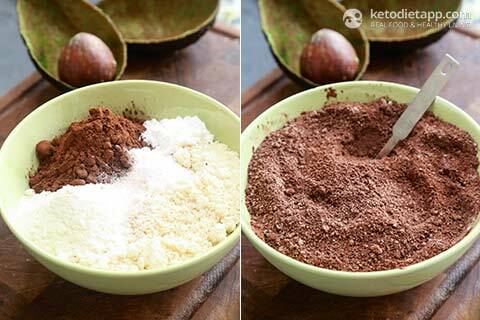 I only have almond flour, how much almond flour can I substitute for coconut flour in this recipe? Although I haven't tried it in this recipe, in most baked goods you can substitute coconut flour with almond flour in 1: 3 ratio (for every part of coconut flour, use 3 parts of almond flour). In this recipe, it would mean that you should use 3/4 cup almond flour instead of 1/4 cup coconut flour. Can I use only almond flour and also, omit the avocado? Wow these came out so great! Didn't realize these would be so thick but thats fine because that means more brownie per serving for me! They are very dense though and definitely taste of dark chocolate. I uses 100% unsweetend dark bakers chocolate and used drops of stevia to sweeten. Would like to see what I could do to make these just a tad bit less dense so I'm not grabbing a glass of water to get these down. Any suggestions would be helpful. Kids devoured these like no tomorrow so absolutely making these again! I made these and they were so good. I did alter it a bit by only adding 1/4 cacao instead of 1/2 after reading a comment that it was a bit strong. I wasn't sure if I needed to replace the other 1/4 cup so I added defatted peanut flour hoping the peanut butter taste would come through but it didn't. Next time I might try adding 1/4 cup of oat fiber instead and see how that does. If I omit 1/4 of of the cacao powder do I need to add something else in it's place? OMG I just made them and they are so good! First I thought they will be dry but they are so moist. I made these tonight to test out a new convection toaster oven that we bought. They are -perfect-. Thank you for such a great recipe! I used 100% instead of 85% chocolate and kept the same amount of erythritol and just a few drops of chocolate stevia. Absolutely delicious served with whipped cream and a dash of cinnamon. These are delicious! I also calculated that these have more like 11 net carbs per serving, almost all from the swerve alone. My food database says that 3/4 cups swerve has 180 g of net carbs. Is there a different product I should be using? I just made these brownies...YUMMMM!!! I did used Truvia baking blend, however, which does have some sugar in it. I didn't have a full bar of the 85% chocolate, so I used about 2 oz of 85% and 1.5 oz of unsweetened baking chocolate. I was trying to figure out how much of the Truvia baking blend to to use, so I just decided to use 3/4 cup like in the recipe, and I made the right call! It obviously ended up making calories and carbs higher, but sugars weren't bad. From my calculations using My Fitness Pal, each serving came to roughly 200 calories, 16.2g fat, 12.2g total carbs, 4.5g fiber, 1.2g sugar, and 5.6g protein. And honestly, one brownie was enough! Rich and delicious! I was very excited to try these. I used Ghirardelli 86% chocolate and I used stevia because I didn't have the other sweetener. Unfortunately these were SO strong dark chocolate tasting I couldn't enjoy them. If you really like dark chocolate you'd love them (so I'm sure my husband will enjoy!) I ended up making a cream cheese frosting for them and that helped a bit. I haven't been super low carb as long as most people so maybe that's my problem. Who knows? I might try these again in a few months. Thank you for sharing your tips! I do have to admit these are for dark chocolate lovers, they do taste quite strong  Maybe your palate will adjust in a couple of months, at least mine did. Or you can try 70% dark chocolate next time? Please can I use these same recipe as normal chocolate cake recipes? Made these again and topped them with fresh cream that I whipped this morning. I do have to say that having the right equipment makes so much of a difference when making food. The Kenwood is just an amazing machine in the kitchen ☺️ This recipe always comes out great and has become a family favourite. It definitely does! I think that my food processor and slow cooker were the best investments ever! Made these they were awesome! Thank you so much Janice! I'll definitely make a free eBook at some point  You can print the recipes (see top of the post and "print recipe - full" or "print recipe -compact" - recommended). HI there! 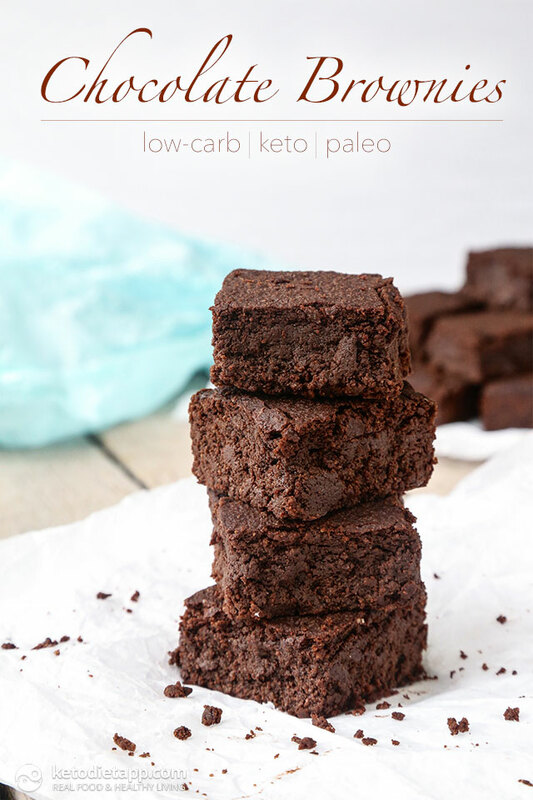 I have a blog called SugarSobriety and I just featured this brownie recipe on it! I basically put the link to your sight, LOVE this recipe and it's totally helped me with my battle with sugar! Thanks! Love, love, love these brownies! I even made a batch for my family (well, in their case with maple syrup) and everybody loved it. I´ll definitely make these again and again. Thank you for your hard work. Can you advise if I use just powdered Stevia, how much should I put? Hi Elina, if it's a stevia + Erythritol mix, use about between 1/2 cup to 1/2 cup + 2 tablespoons. If it's pure stevia powder, I'd guess that no more than a teaspoon. I don't use pure powdered stevia - just stevia drops so I'm not sure. You may need to try by using less and add to your liking (stevia can be bitter if you use too much). I made these brownies last night and this is the first time I have had low carb brownies that actually taste like the brownies I used to make. Best I have had in 3 years. Thanks for another great recipe. 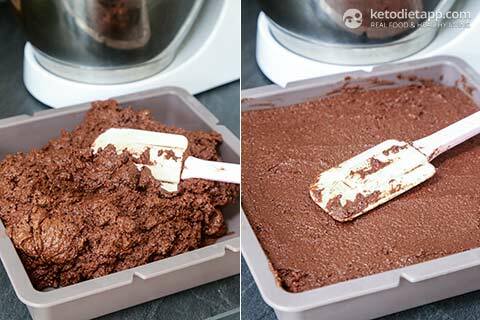 These are absolutely the BEST Keto brownies! Martina - these brownies are fantastic!! Even my non-Keto husband loves them. Thank you!!! That's awesome Susan, thank you so much!! I made these for work on New Years eve and they were a big hit. I brought my own goodies thru out the holidays and ate good healthy keto foods of which most of them were from your app and blog. Because of the availability of both yummy and easy to make meals and snacks, I remained keto-adapted and didn't fall off the keto-mobile.  Yaay! Just made this brownies. Love them! Your recipes are an inspiration. Congratulations on your new book. This recipe is amazing! Love it! I just made a batch, they taste great! 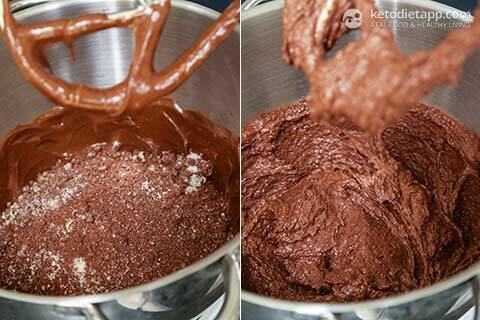 Using both chocolate and cocoa is key to making brownies that are worth eating. Good job! Adding a teaspoon of instant espresso grounds and a half teaspoon of cinnamon also adds a rich depth but doesn't make the finished brownie taste like coffee and cinnamon.